Thanksgiving is upon us and after years of getting creative you might feel like your basic yellow, orange, red and brown, straw shaped pumpkins and cornucopias with plastic food coming out of it as décor days are OVER!!!! WHEW! 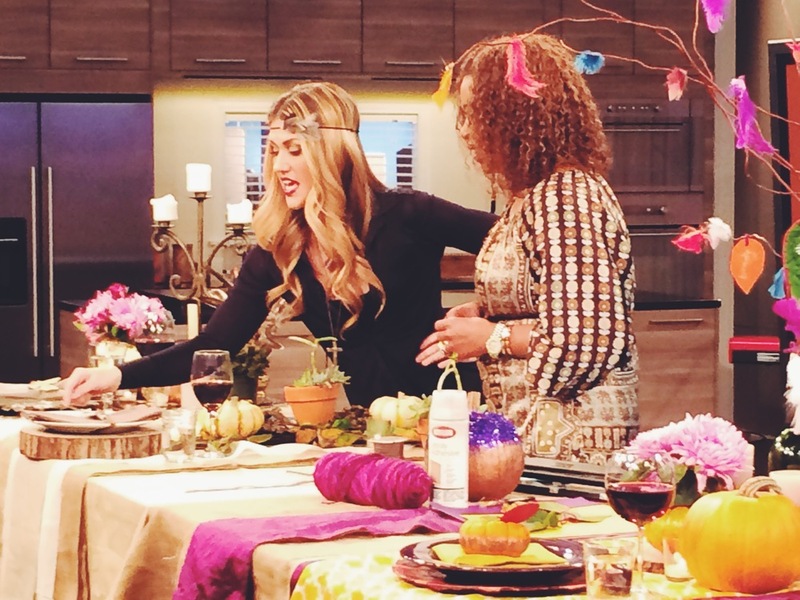 Check out my latest segment where I incorporate 3 key elements that scream THANKSGIVING and make your guest feel grateful they chose your house to dine! Before you jump into your design remember 5 basic things when creating your table. Don't just do a one dimension table, by adding layers of fabric to design it makes your table feel finished and full. Candles Candles and Dimmers. You don't want to feel like you are on display while your shoving tons of food in your face, you want to feel together and pretty. Light room enough to make sure your eating what you wanted to eat but dark enough to ignore wrinkles. Don't have everything on your table at one level try to diversify sizes. However make sure not to block eye level, either go higher or lower. Find a way whether themed or in place setting to make each guest feel part of the party. the fancy. the earthy. the quirky. I love mixing rich fabrics with shiny leather pieces. This is the perfect setting to make design feel luxurious and slightly romantic. Use lots of candles and even candelabras. I glued feathers in a circle form on my charger to really give this setting a WOW factor. Making interesting centerpieces using feathers. Getting a sterophone ball cover in fabric and poke feathers through creating cool arrangement. For added pizazz, gold leaf 1/3 of feathers in different designs or just leaving the edges. Spray paint pumpkins gold, cut the top off, clean out insides and repurpose it as a vase. Arrange a beautiful flowers in a small vase and place in pumpkins. (I always check the clearance aisle at the store, typically the flowers will last 3 or 4 days more. It can totally be worth it! Spray paint leaves from yard gold and use throughout centerpiece, I also used as a personalized place setting. Its a simple touch that adds interest to table. Burlap is the perfect tablecloth to make a table feel rustic adding light and airy fabric will keep it light and lovely. Elements of the earth, pieces of wood to hold candles, foliage, bark, ect are great to incorporate in centerpieces. I also used sliced woods as chargers. Making a leather wrap with a feather in it to use as napkin holder and repurpose as sylish headband. Cut a hole in it and place a potted succulents for an earthy floral arrangements or get neutral muted pumpkins in grey or white with speckles of color. Cutting leaves from trees or bushes and laying them as garland is muy beuno and free!!! This is the kid friendly vibrant placesetting. Incorporate standard Thanksgiving colors but to the brightest degree. You can bring fun interest to your table by adding funky prints in the tablecloth and runner that aren't typically thanksgiving style but brighter thanksgiving colors. Create colorful chargers using craft paper and Mod Podge and do a little decoupage. In the center of the table create a thanksgiving tree full of guests' gratitude, kids included. Hang colorful feathers from the tree to give dimension and and tons of vibrant colors. With colorful paint create interesting designs on pumpkins or if you want to make it sparkle glidazzle that bad boy with glitter. I recommend using painters tape to create straight lines on pumpkin with the glitter and paint. Also I fun idea is to paint mini pumpkins with cool designs and use them as a personalized placesetting. I literally grabbed leaves from outside, used spray adhesive on colored paper, then laid the leaf on it, cut around leaf, hole punch leaf, added string, wrote on the paper side something I was thankful for and hung from my charlie brown thanksgiving tree. This is a great activity to have guest do before they sit down and then you can read them around the table. I love anything that creates interesting conversation. I hope that one or more ideas help you in the craziness of the holiday season. I am so thankful that you would take your time and tap into my creative world. I am grateful for you!